Today’s three word ‘micro’ book review features the latest in the fantastic (and certainly not micro) Jack Reacher series – THE MIDNIGHT LINE – by Lee Child. Lee Child’s latest addition to the Jack Reacher series is Reacher #21 – NIGHT SCHOOL and I was super excited to get my hands on an early proof copy – black covers, very minimal (rather like the great Reacher himself). Or at least it was very minimal, till I travelled to Scotland with it in my overnight bag, and the glitter originally stuck onto the wrapping paper of a gift I was taking relocated itself onto the book cover. I guess I’m probably the only person with a glittery copy of NIGHT SCHOOL! Well, as always, Reacher #21 delivers the Reacher-style goods. It also forces fans to delay gratification on the present day Reacher/Chang what-happens-next question from the end of the previous book – MAKE ME – and instead takes us back in time to when Reacher was still in the military. Not an easy delay for an impatient Reacher addict like me to take, but as Lee Child pairs Reacher back up with Neagley I’m willing to concede it’s a fair trade. And in NIGHT SCHOOL it’s fascinating to see Reacher back in the structured environment of the military – reacting to the confines of protocol and hierarchy, yet still very much ‘being Reacher’; hard-wired to do whatever is needed to get justice, pushing blocks out the way (or ignoring them), and challenging the status quo. There’s a strong investigatory feel to the story, with lots of twists and turns to keep the reader guessing, and the pace whips along at breath-taking speed. The relationship between Reacher and Neagley is complex and interesting – the mutual respect, the banter, the attraction yet inability to connect physically due to Neagley’s phobia of being touched. It was a joy to spend time with them in NIGHT SCHOOL and I’m hoping that we might get to see more of their relationship in future books. NIGHT SCHOOL is everything you want from an action thriller – fast, hard and gripping. Read it now, then go back and read all the rest! And, for the next book in the series – Reacher #22 (I’m guessing black cover, no glitter) what I REALLY want to know what happens between Reacher and Chang! Well, it’s classic Reacher, as you’d expect. He’s picked Mother’s Rest as a place to visit because he’s curious about the name of the town and in finding out the history behind it. But Mother’s Rest has far greater secrets hidden within it, as Reacher is soon to discover. On the railroad platform he meets Ex-FBI Special Agent, Michelle Chang. She’s looking for her colleague – a fellow investigator who’s gone missing while looking into a hobby case. Her data has led her to Mother’s Rest, but the trail has gone cold. While the residents of Mother’s Rest seem initially friendly, Reacher starts to suspect that he’s being followed and checked up on. When he tests his theory he’s proved right. Suspicious, he decides to help Michelle Chang find her colleague. With little more to go on than a scrap of paper with a phone number and a reference to two hundred deaths, Reacher and Chang dig deeper to try to find Chang’s colleague and the client that got him interested in the case. And as they get closer to the truth, and the people that want it to stay hidden, the stakes and the danger ramps up higher and higher. As ever, this latest book in the series is a thrilling read; rapid-paced and packed with action it follows Chang and Reacher’s investigation as they hunt for the truth and overcome the (many) challenges in their way. 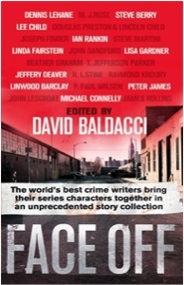 Fans of the series will, I think, find the Chang and Reacher relationship an interesting one. Reacher, ever the loner, seems to develop a stronger bond with Chang than with some of the other women who’ve come into (and out of) his life in the past. It’s a physical thing, sure, but he seems to be having thoughts about a future for their relationship after the immediate puzzle is solved and the danger past. Is Reacher ready to settle down? It’s an interesting question – but you’ll have to read the book to see how things turn out [no spoilers here – sorry!]. MAKE ME is out in paperback today. It’s an absolute must-read for Jack Reacher fans, and for fans of the thriller genre, from a writer at the very top of their game. What the blurb says: “Someone has taken a long-range shot at the French president but failed to kill him. The suspected sniper has serious skills and is a hard man to find. Reacher tracked him down once and put him in jail. Now he’s asked to hunt him again, and put him away permanently. 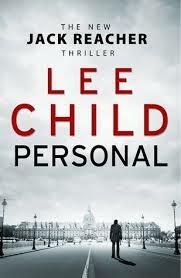 As a massive fan of Lee Child’s writing, I must confess that it was a huge thrill and a privilege to get to read an advance copy of PERSONAL. In PERSONAL – the latest novel and nineteenth in the Jack Reacher series – Reacher spots an advert in the Personals from a military colleague asking him to get in touch. He owes this guy from way back and so Reacher being Reacher, he makes the call and finds himself pulled into a high profile case that threatens international security. There’s been an attempt to assassinate the French president. The sniper fired from a range of fourteen hundred yards, more than three-quarters of a mile. There are very few people in the world that could have made the shot, and one of them has a bad history with Reacher. Question is, was he the one who pulled the trigger? And, if he was, can Reacher track him down before he tries again at the London G8 summit? Partnering up with young agent Casey Nice, Reacher follows the trail, taking him from the US to Paris, on to London and back to the US. But with half-truths and bureaucracy at every turn, the inter-agency team remains a step behind their person of interest. With the time ticking away, Reacher takes matters into his own hands – in a way that only he can. This is a fabulously fast paced, action packed story, with all the twists and turns you’d expect from a Reacher novel. Reacher himself is as witty and smart as ever, and a strong mentor for Casey on her first operational mission on overseas soil. And it’s great to see Reacher making a trip across to Europe. I particularly loved the London scenes, and picturing this great character in locations that I know. Cinematic and slick, this heart-thumping, page-turning read is a must for all thriller fans. PERSONAL is out in paperback on the 23rd April. It’s a fantastic book of short stories, each one just perfect for reading over breakfast, or taking with you to read at lunchtime as you eat your sandwiches, or for a sneaky bit of procrastination when you should be doing something else! (1) One entry per reader (2) UK residents only – due to postage costs – sorry! (3) We will draw the winner at random (4) No cash alternative (5) The competition closes for entries at 9pm GMT on Sunday 25th January 2015 (6) The judge’s decision is final and no correspondence will be entered into.